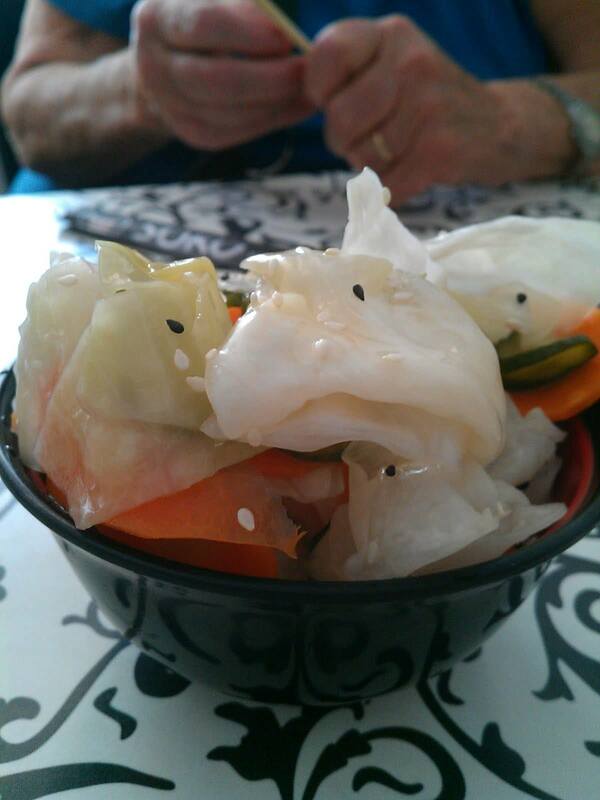 Japanese Pickles (9 nis). I really like them as they stay crisp but soft (don’t even know how’s it possible). They were sweet and sour and a good start for the meal. 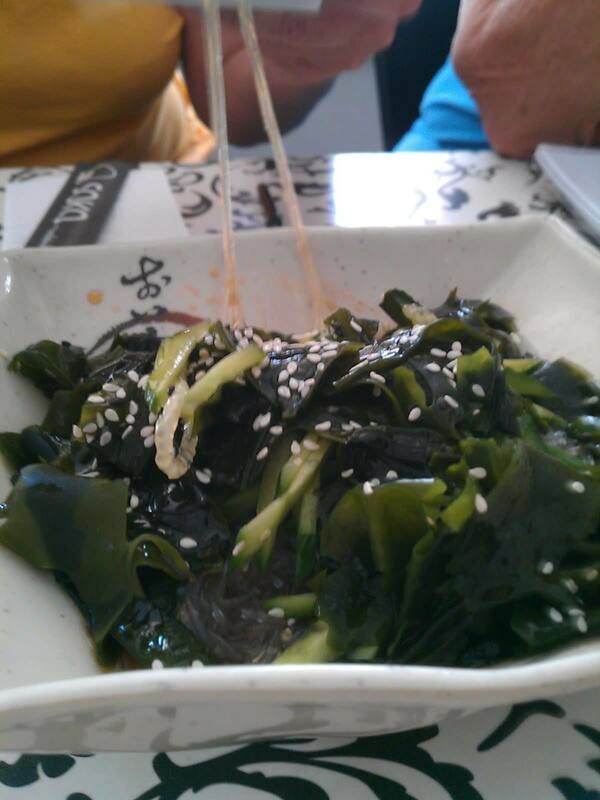 Wakama sea-weed salad with cucumbers and rice noodles (18 nis). I like it, problem is that it’s sitting inside a pool of soy sauce.. And the noodles become hard to handle, they all stuck together, and when finally loosen it hits you in the nose, splashing the soy all over. 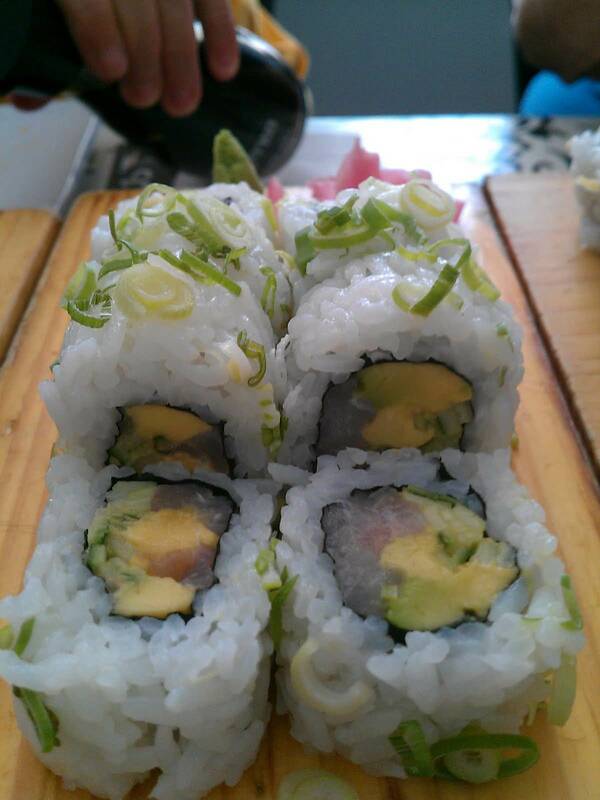 Insideout sea-brim, avocado, cucumber and chives (27 nis). Nice one. 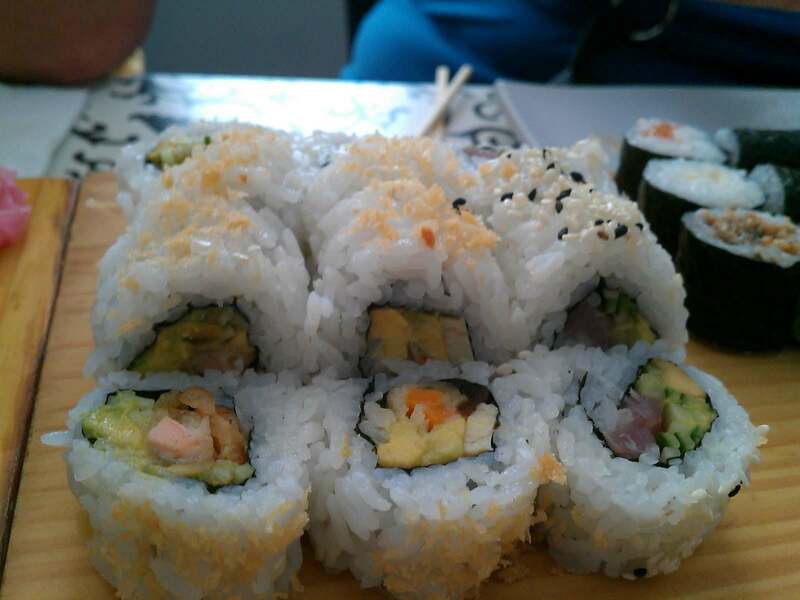 I always most impressed with the white fish rolls. I think this was the Mix combination (62 nis). 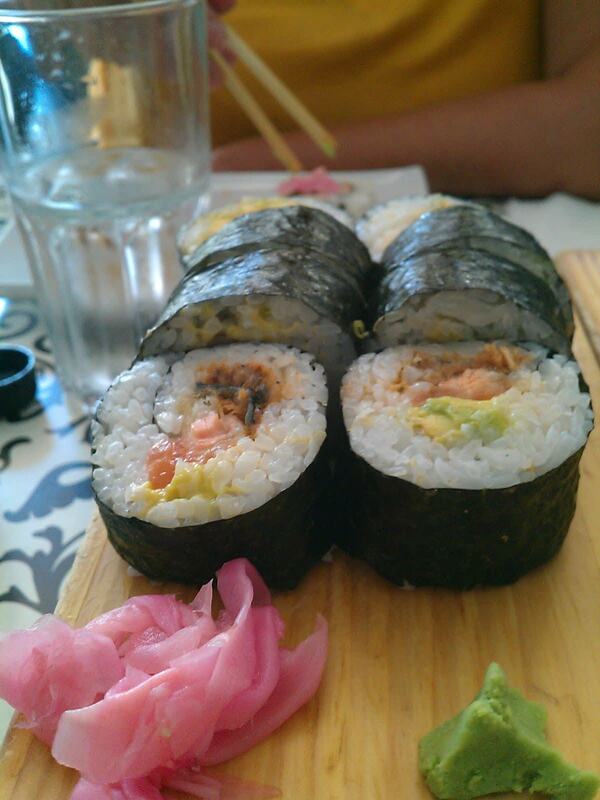 Maki roll Special Soko with salmon, salmon skin and salmon tampura and avocado (31 nis). For that fat roll I would expect more filling and less rice. I would even prefer it to be thinner with less rice, and no change in the filling amount, but who asks me… Overall it was OK. 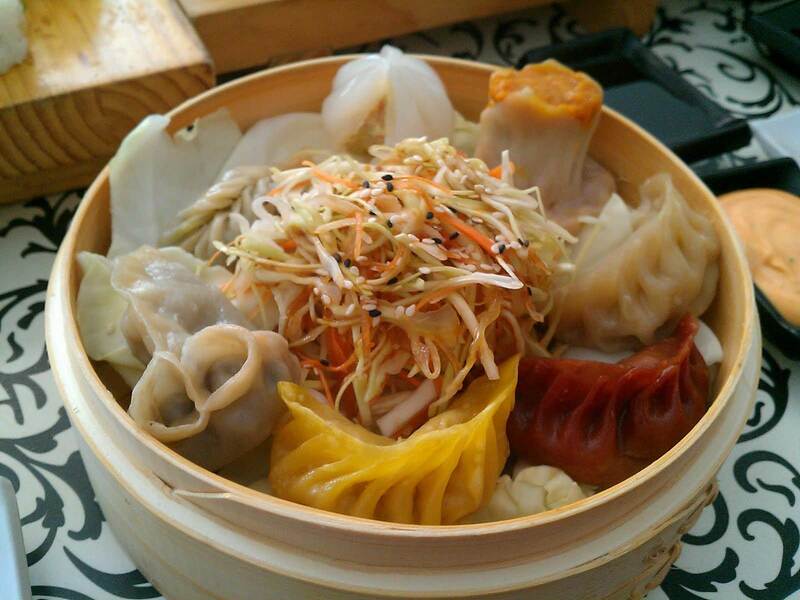 The dim sum dish that was supposed to be a starting dish came last but was well worth the wait, it was good and colorful, with cabbage salad in the middle and 8 pieces of steamed dim sums around it. Some were better (mushroom, green filling, meat and minced chicken filling) and some less (sweet potato was weird), but most of them on the better side. Don’t know the cost as this is a new dish that’s still doesn’t show on the on-line menu. Overall it was a good value lunch. I didn’t see an option to personalize a roll but maybe they would do it if you asked. There wasn’t some of the goodies like asparagus, shitaki mushrooms. Very simple, and also kosher so no shrimp and eel that I also love. But the rice was good and the waitress was nice and we got everything we asked for pretty quick and cheap. We were all very full afterwards and It came out less than 200 nis (we also took some TA for Elisheva’s kids), and I took the remaining 6 or so pieces home (nothing like a day old sushi for breakfast. Yam!). I just searched google for “soko hod hasharon” in english, and this was the #1 result! I read the post and it brought back great memories! reminded me how much I miss you Mashav!! !